Ebay 150 off on 350: Ebay offering Flat 150 off on 350 or more purchase. Ebay is and world wide site for Shop online, have variety of products, & offering great discount. 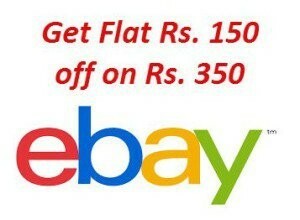 Buy Products worth 350 rs by paying just 200 rs from Ebay. Grab the deal now before it ends. & don’t forget to check suggestions. Save 150 rs from this ebay 150 off coupon code.